With the 4.15 release, 1859 of the 16223 commits (11.5%) were tagged as "Fixes", so that's a fair amount of work going into bug fixing. I suspect there are more commits that are bug fixes, but aren't using the "Fixes" tag, so it's hard to tell for certain how many commits are fixes without doing deeper analysis. 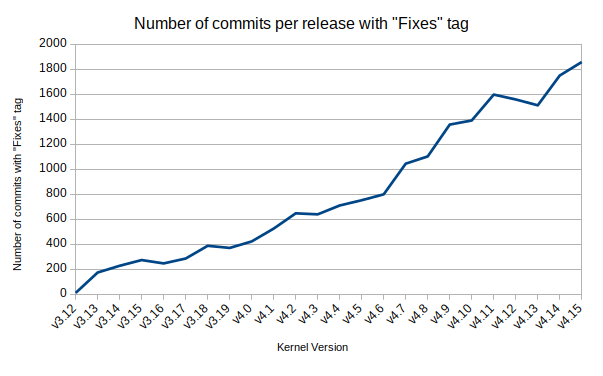 Probably over time this tag will be widely adopted for all bug fixes and the trend line will level out and we will have a better idea of the proportion of commits per release that are just devoted to fixing issues. Let's see how this looks in another 5 years time, I'll keep you posted!